In patients with stable asthma, the accumulation of pathogenic mucus, which is not readily cleared from the lungs, can result in asphyxiation. The factors that underlie the decreased ability to transport asthma-associated mucus out of the airways are unclear, and little is known about the composition and organization of this mucus. Luke Bonser and colleagues at the University of California San Francisco evaluated mucus plugs from individuals with fatal asthma and determined that these plugs are heterogeneous gels with distinct mucin-containing domains. The majority these domains were composed of MUC5AC, some domains contained only MUC5B, and a small fraction had both MUC5AC and MUC5B. Cultured human bronchial cells from donors without asthma produced a uniform MUC5B-containing gel; however, stimulation of these cultures with the asthma-associated cytokine IL-13 resulted in formation of heterogeneous, MUC5AC-containing mucus. 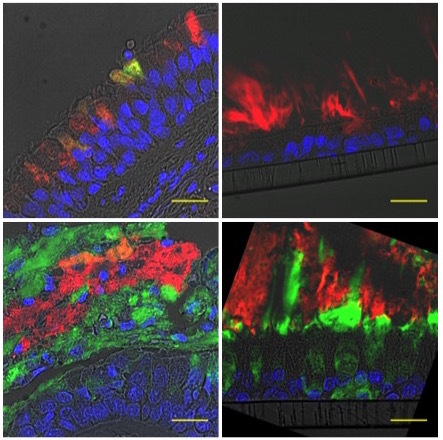 IL-13 treatment impaired mucus transport, but not as the result of the loss of cilia function. Instead, MUC5AC-containing domains were tethered to the epithelial surface and could not be washed from IL-13-treated human bronchial cells. Removal of tethered mucus from the apical surface with a reducing agent restored mucus transport. Together, these results indicate that epithelial tethering of mucus contributes to airway obstruction in asthma. The accompanying image shows mucin staining (MUC5B, red; MUC5AC, green; DAPI, blue) in the airways of individuals without asthma (top, left), individuals with fatal asthma (bottom, left), and in untreated human bronchial epithelial cells (top, right), and IL-13-stimulated human bronchial epithelial cells (bottom, right). Note the predominance of MUC5AC (green) in both fatal asthma and IL-13-stimulated human bronchial epithelial cells. Citation Information: J Clin Invest. 2016;126(6):2367-2371. https://doi.org/10.1172/JCI84910.